Sciblogs | Four decades of Ecological Overshoot leaves us with…? 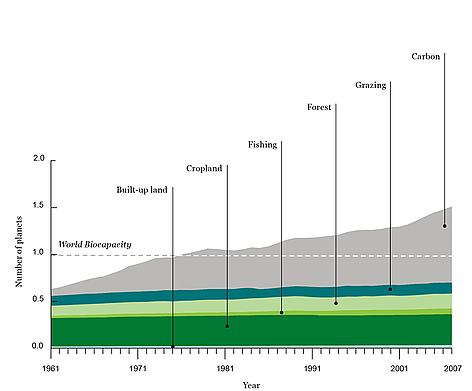 Four decades of Ecological Overshoot leaves us with…? Isn’t it fun hearing about how the world is heading towards disaster? Well, you’d think so! because we just keep churning out report after report (and scheduling the odd meeting) with increasingly dire predictions as time goes on. Creating these reports is quite the rapidly growing niche. We must want to hear about this, or perhaps, the topic has just finally fallen within the range of our short-termism – is collapse really just around the corner? The world over, young people especially are getting pretty pissed off. Fairness is continuously undermined with too little done to address our ecological overshoot. By the way, if you haven’t come across the term ecological overshoot before, this is how I’d explain it: All of what we do to keep ourselves alive and amused uses up natural resources and generates what we tend to call “waste” (a linear process), and because Nature in all its glory has cycles (e.g. hydrological, nutrient, etc) this “waste” can be used as an input and processed into some more resources. However, our excessively-greedy developed-world lifestyles have been creating more waste than can be cycled and using up more resources than are generated. According to the Global Footprint Network, the world has been using up its resources faster than they could be replaced since the 1970’s! Oh look at that, another report! WWF’s 2012 Living Planet report has just been released today… stating plain and simply: “by 2030, two Earths would not provide enough land to support humans’ use of resources.” Stuff news gave a good head’s up about it, but the irony of seeing “Next Science Story: Making the most of NZ’s undersea wealth” underneath was enough of a reminder that we aren’t on the path of taking it seriously yet. Sigh. Adopting a low-carbon lifestyle is not an overly fun sounding concept (it’s a pretty unconvincing – yet scientifically accurate – name!) but hearing about some of the solutions that are coming to meet this goal give me hope that it could also be perfectly adequately exciting and fulfilling. We have done amazing things on this earth, if you’re a visual learner see here; we can do more, and do it better. Robert Hickson said it well in his latest blog, more scaremongering isn’t helpful and focussing on solutions would be a better use of our time now. So stay hopeful, get exploring into how you can turn some of your linear processes into cyclical ones, and give a leg up to all of the people that you know who have the power to make low-carbon lifestyle options a more attractive and rational choice for the rest of us. Time for a one child policy. Population issues are kind of made worse by the most accelerated growth rates being in parts of the world where ecosystems are under greater pressure. Parts of Subsahran Africa and Middle East have persistent high population growth rates, are running down their water-supplies and have limited means to increase agricultural production.